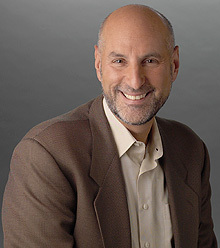 Bruce Chizen, president and CEO of Adobe Systems Incorporated, will be the keynote speaker this year at the commencement exercises for UCSC's Baskin School of Engineering. The event will take place on Sunday, June 13, at 3:30 p.m. at the Lower West Field, Oakes College, on the UCSC campus. "Mr. Chizen is a visionary and dynamic leader in the information technology industry, with a great interest in higher education, and I am very glad that he has agreed to give this year's commencement address," said Steve Kang, dean of the Baskin School of Engineering. Chizen, who also spoke at UCSC's Clark Kerr Symposium last October, said his commencement address, entitled "The Power to Change the World," will offer an upbeat message. "This year's graduates may mistakenly believe that they've caught the engineering and high-tech boom-or-bust cycle at precisely the worst time," he said. "But I believe that we're on the verge of new growth in the high-tech industry. UC Santa Cruz engineering students, who are known for being exceptionally creative, innovative, and optimistic in their approach, are in the position to help lead Silicon Valley toward the next 'big thing.'" Led by Chizen since 2000, Adobe is one of the world's largest software companies and is headquartered in San Jose. While evolving Adobe's market strategy and extending its customer reach, Chizen also has maintained the company's legendary employee culture. In 2004, Adobe ranked sixth in Fortune magazine's annual report on the "100 Best Companies to Work For." Prior to becoming CEO, Chizen defined new market opportunities and led the development of products as Adobe's executive vice president of worldwide products and marketing. He previously held key marketing and sales positions at Mattel Electronics, Microsoft Corporation, and Claris Corporation. Chizen holds a bachelor's degree from Brooklyn College, City University of New York. He serves on the board of Synopsys, Inc., and is president of the board of directors for the Children's Discovery Museum of San Jose. UCSC's Baskin School of Engineering, founded in 1997, is building excellence in three critical areas: information technology, biotechnology, and nanotechnology. Inherently interdisciplinary, these areas complement and supplement each other, advancing the school's strength and promise. The school serves the needs of the greater Silicon Valley region and the state of California by creating and disseminating knowledge through research and teaching, and by offering curricula that nurture creative thinking and prepare students for productive careers at industrial and academic settings in rapidly evolving areas of science and engineering. In addition to the engineering school, UCSC's ten colleges and the graduate division will also hold commencement exercises.